Plan and write an essay in response to the assigned topic. Use the essay as an opportunity to show how clearly and effectively you can express and develop ideas. Present your thoughts logically and precisely. Include specific evidence or examples to support your point of view. A plain, natural writing style is probably best. The number of words is up to you, but quantity is less important than quality. Limit your essay to two sides of lined paper. You’ll have enough space if you write on every line and avoid wide margins. Write or print legibly because handwriting that’s hard or impossible to read will decrease your score. If you finish in less than twenty-five minutes, check your work. The ten prompts that follow are suggested for essay-writing practice. Because it’s virtually impossible to write the same essay twice, try writing on the same prompt over and over, each time choosing another point of view. Then compare the results. SAT prompts typically begin with a short passage or quotation followed by a related question, which you are to answer in your essay. Always support your answer with reasoning and examples taken from your observations, experience, studies, or reading. 1. The familiar admonition to “put your money where your mouth is” suggests that it’s far easier to speak up for a principle than to live up to it. That’s why most of us, whether we intend to or not, say one thing but often do another. It’s just part of human nature. Assignment: Is the common tendency to often say one thing but do another built into our nature, or is it something that experience teaches us to do? Assignment: Are negative emotions stronger than positive ones? Assignment: Is Jim Smith correct—that courage is a widespread human trait that most people never have a chance to use or demonstrate? Assignment: Is lying acceptable or even obligatory at times? Assignment: Can ignorance ever be better than knowledge? Assignment: Do you believe that the choices we make, rather than our abilities and talents, show who we truly are? Assignment: If we were to become completely open and honest with ourselves and with others, would society be better off? Assignment: Is there always a gain from experiencing hardship? Assignment: Are human emotions more powerful, enduring, and meaningful than our intellect? Or to put it another way, does the heart matter more than the brain in our lives? Assignment: Do happiness and contentment depend mainly on serving others and making a difference in their lives? Before you evaluate your essay, reread how SAT essays are scored. 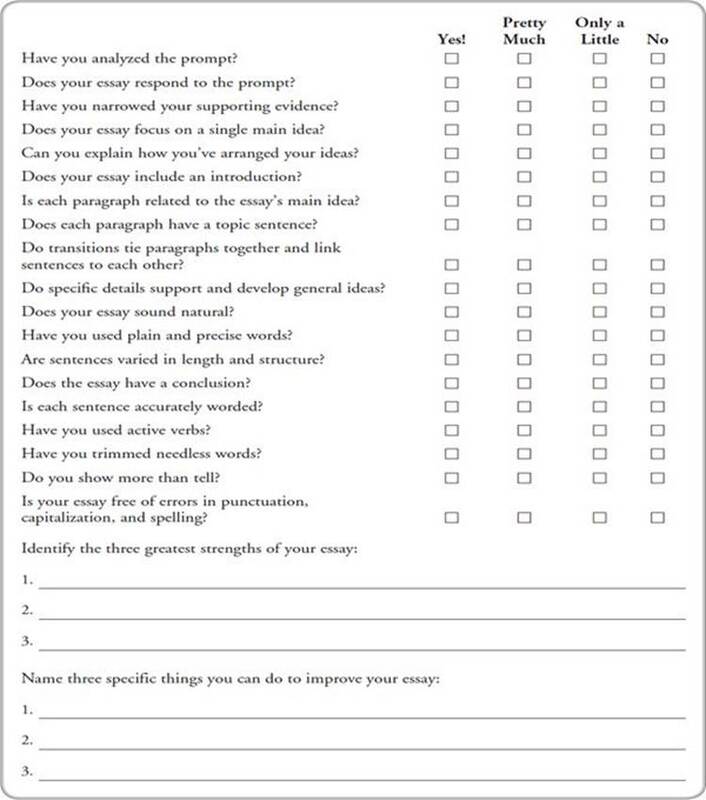 Then complete the following checklist for each of the essays you’ve written. Because SAT readers will give you credit for what you’ve done well, try to focus on your essay’s strengths. But don’t ignore weaknesses. If you happen to find any, turn to the appropriate section of this book for a quick fix on how to remedy the problem.